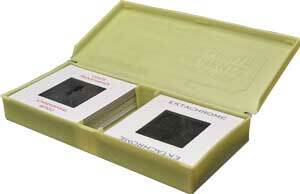 How should you prepare and pack your 35mm slides? 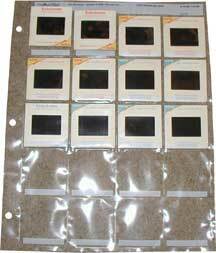 Rubber band the 35mm slides or leave them in your 35mm slide carousel and ship the whole carousel box? If you have the slides in Carousels, you can save yourself a lot of time and trouble by just shipping us the whole carousel. Yes, you will pay more for shipping costs, but you will save yourself the time and trouble of taking the slides out and putting them into stacks, labeling them, and rubber banding the stacks. If you have to take your slides out of a container, and you are looking for a solution other than stacking them and rubber banding, you might want to consider this novel idea for packaging them. Use an aluminum foil or saran wrap box. These are ideal sizes for putting your slides in. 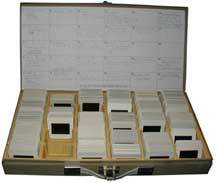 If you have the metal or plastic containers of slides, as shown above, you can just ship the whole thing to us. Make sure that the slides are all facing in the correct direction so we can just take a handful out of the box and scan them in the proper order. If you have the Bell and Howell 35mmSlide Cubes that you use for 35mm slide storage, just send the whole cube along. This is ideal because they hold just the right amount of slides. Just make sure that you have all your slides oriented correctly and facing the correct way. 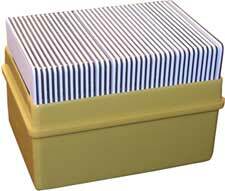 The yellow box above, is a good container. It is easy for us to just grab a handful of slides and run them through our scanners. You still have to orient the slides correctly and indicate where the starting slide is. If not, we will assume that it is the slide that "faces the screen. We are sorry but the following slide containers make it hard for us to efficiently scan your slides and maximise our workflow. These following types of containers will need someone to take the slides out and put into stacks. If we have to take your slides out of these types of containers, we will need to charge you a small fee to do this extra work. We need you to help with some of the work in order to maintain our low prices. Slim containers, such as those above, are not acceptable under our low pricing. It takes us too much time to remove the slides and put them back in but we can do it for you for five cents a slide. These plastic notebook holders require extra work for us to take the slides out and then replace them. We will have to charge slightly extra if you want to send your slides like this. We will remove them for a charge of five cents per slide but we will not put them back in again. We will rubber band them and send them back like that. You will have to put them back in the sleeves. 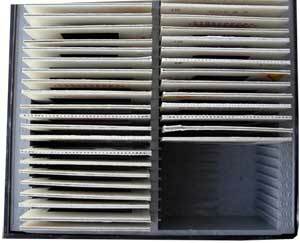 If you have the Airequipt slide cartridges, you will have to take your slides out and put them into rubber banded stacks before you send them to us. Or you can pay our employees five cents a slide to do it for you. The Airequipt cartridges are particularly hard to work with because the slide is contained in a metal holder. Not only does it take us extra time to have to take the slide out of the cartridge but we also take a lot of time removing the slide from the metal holder and many times the metal holder is damaged in the process. If you have us take the slides out for you, we by no means are able to put them back in the holder or the cartridge. Your slides will be put in stacks and rubber banded together. We are sorry for this inconvenience but, once we get your slides digitized for you, you won't need the Airequipt cartridge, the metal holder or the slide, again. 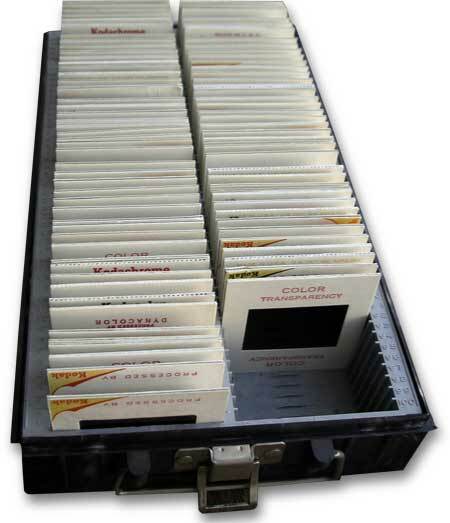 If you send slides in a container such as these, there is no way we can grab a handful of slides out of it. They have to be taken out, one by one and this takes us extra time. If you want, we can take them out and stack them for you for five cents a slide.